All golf courses need water. No golf courses needed all the water that dumped on Sussex County this past week. The normal chipping area for the practice green at Shawnee Country Club became a pond thanks to a three-inch downpour June 27, part of a 16-inch drenching the course experienced from June 25 through June 28. It is entirely possible to have far too much of a good thing. The tropical air mass that hovered over much of the Cape Region and other parts of the county hung around for several days, unloading far more rainwater than the area could manage. The deluge washed away bridges and roads, flooded homes, and enticed some folks into drowning their cars and trucks with some remarkably stupid driving maneuvers. Fortunately, most of the Cape Region’s golf courses should be able to handle the aquatic onslaught, if area golfers will remain patient. Tim Mumford is the golf professional at Sussex Pines Country Club near Georgetown. He said that as an older course, Sussex Pines doesn’t use some of the more modern drainage systems found at the new layouts. What Sussex Pines does have is a bright superintendent named Harry Wanner, blessed with foresight and a plan that took advantage of the fact that most of the course drains into its pond system. On Saturday, June 24, hours before the storms hit, Wanner began to drain the ponds. He used a reverse backflow pumping system to move the pond water into nearby ditches. Mumford noted that Sussex Pines recorded 8 to 9 inches of rain on Sunday, June 25. The course remained closed from that day through Wednesday, June 28. “Today [Wednesday] we’re cutting some of the greens and turf we haven’t been able to get to for the last few days,” Mumford said. 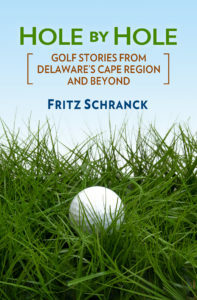 Shawnee Country Club enjoys a local reputation as the one course that drains off faster than any other Cape Region layout. 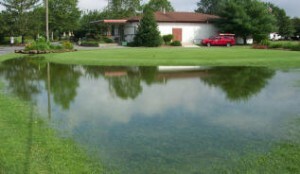 Nonetheless, the popular Milford golf club still suffered a bit from the week’s tremendous rainfall. “We had at least six inches on Sunday,” Shane LeBeau, a club staffer, said. “We’ve had at least ten inches more since then,” including a three-inch downpour that re-filled several low spots on Tuesday evening, June 27. For example, the club’s practice putting green near the pro shop usually has a nice little chipping area next to it. After the Tuesday rainfall, it was more like a chipping pond. The course closed on Sunday, June 25 and was to remain off-limits to golfers through at least Wednesday, June 28. Club golf professional Devon Peterson said, “Our problem is that the greens aren’t built to USGA standards for drainage. The water runs off for a while, but as it keeps coming down, the water lays on top of the greens. Playing on them while they’re still this wet can cause a lot of wear and tear,” he said. Even after the golf courses reopen, however, players can still do a lot of damage to a damp course. It helps if they remember that when standing on wet turf to make a shot, most golfers tend to sink down a bit. If that happens, there’s less chance of a fat hit if the player grips down a half-inch or so from normal. It also helps if the players try to sweep their ball off the grass in wet conditions, instead of chopping down for a big divot. Some courses will also tell golfers to keep their golf carts on the paths, as was the case this week at The Rookery Golf Course near Milton. If more golfers heeded that directive, there’d be far less chance of an ugly set of tire tracks on the fairways that can take weeks to heal.